The EOTB policy document was officially launched by the Hon. Bill Shorten MP in April 2012 at Parliament House, Canberra. This document, developed by the Australian Chamber of Commerce and Industry (ACCI) desktop publication by Monica Shanahan (Mosmondor), calls on business to consider Employing Outside the Box when hiring new employees. Above is Monica Shanahan's portfolio on this design project. 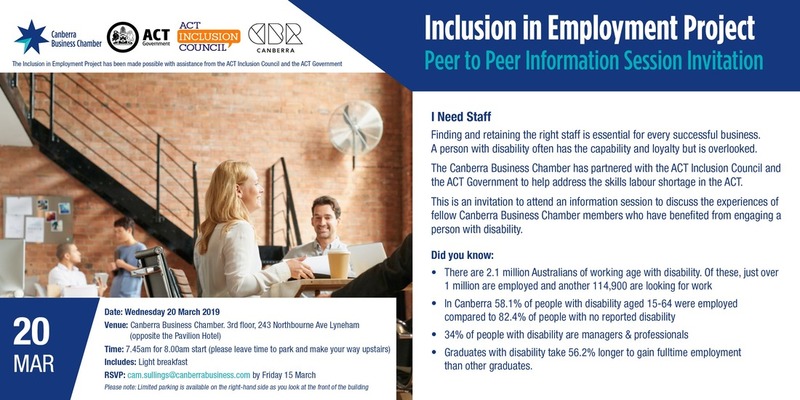 The project supports business to business engagement by bringing together business leaders with experience in employing people with disability and businesses seeking new employees that may not have considered employing a person with disability. You’re invited to the next Peer to Peer information session. This is a free event at the Canberra Business Chamber. Wed 20 March 2019 - 7.45am – 9.00am. The session will give you an opportunity to learn the many positive outcomes that result in employing a person with disability. You will also meet fellow Canberra Business Chamber members who are already doing this. Employ Outside the Box (EOTB) is a series of publications to encourage businesses to diversify their workforce. By providing a clear business case and a systematic approach to internal procedures, the guides help businesses to hire people with disability, mature-age workers, Indigenous Australians and other categories of people with skills to offer. 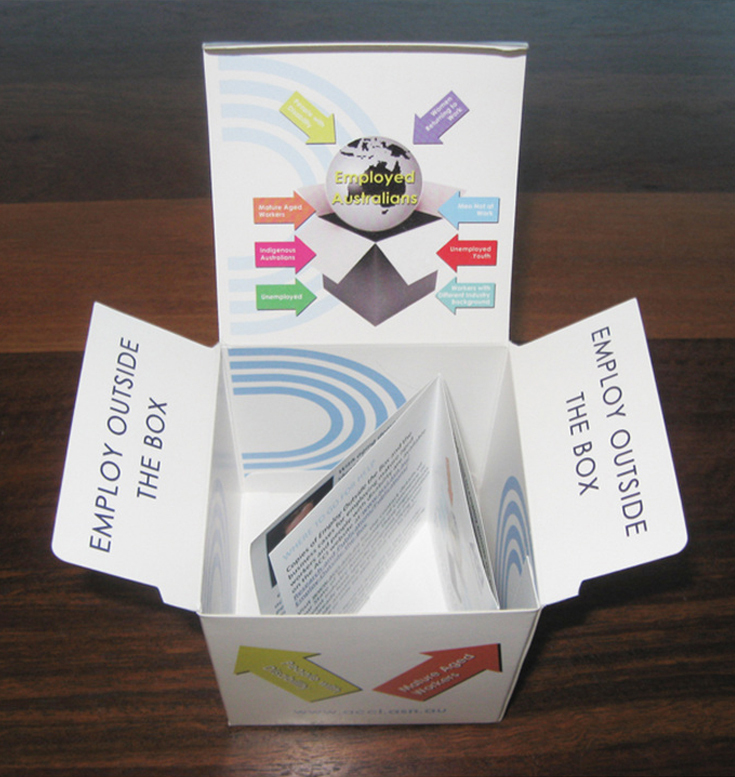 Employ Outside the Box – The rewards of a diverse workforce, ACCI – February 2012. Design & Publication by Monica Shanahan (Mosmondor). 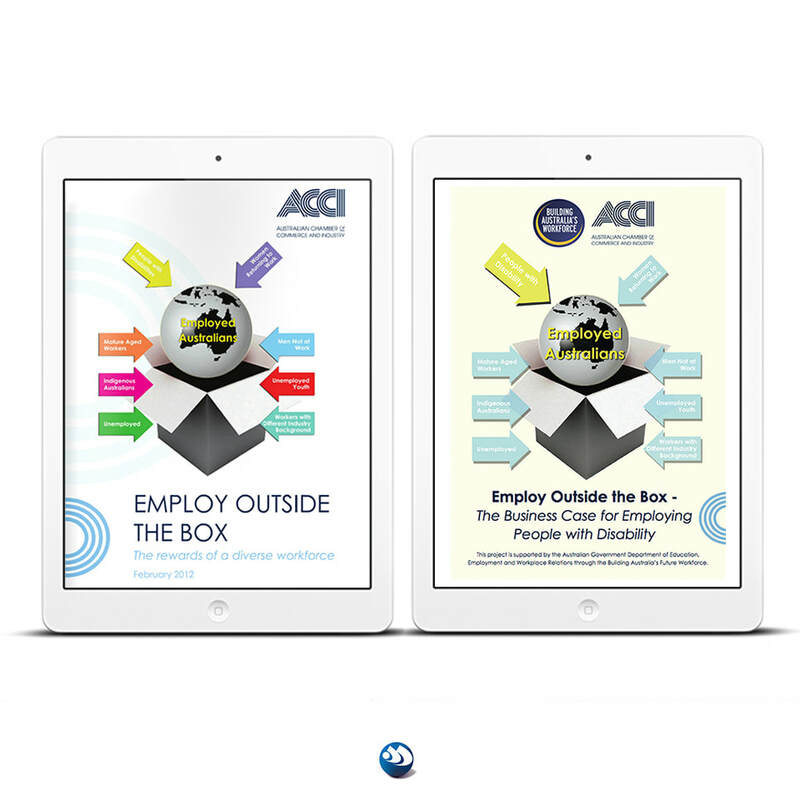 ​Employ Outside the Box – The Business Case for Recruiting and Retaining Mature Age Workers, ACCI – March 2012. Design & Publication by Monica Shanahan (Mosmondor). If Simon McKeon came looking for work at your business, you’d hire him in a flash. His CV would look amazing: Australian of the Year 2011, investment banker and philanthropist. But if he said he had Multiple Sclerosis, would you look for someone else? 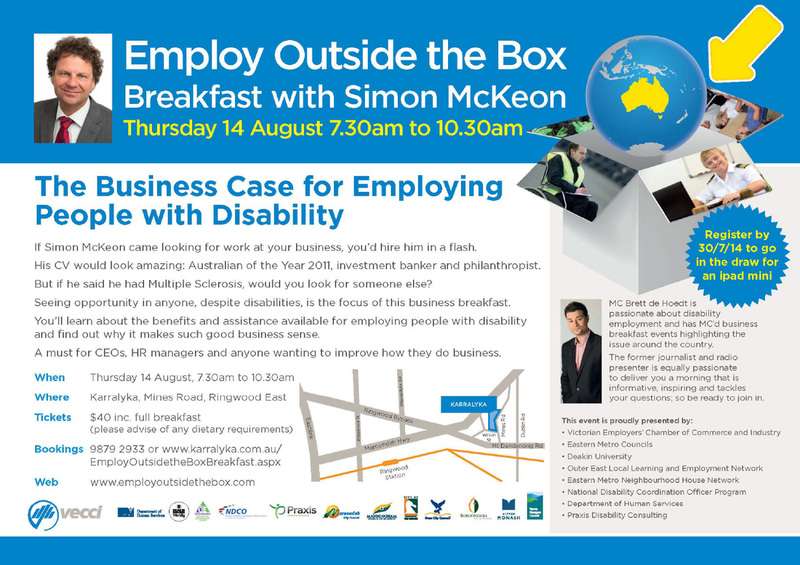 Seeing opportunity in anyone, despite disabilities, is the focus of this business breakfast.You’ll learn about the benefits and assistance available for employing people with disability and find out why it makes such good business sense. A must for CEOs, HR managers and anyone wanting to improve how they do business. The Hon Kate Ellis MP was joined by Jenny Lambert (Director of Employment, Education and Training at ACCI) to address guests and highlight the important role of mature aged workers in today’s workforce. The launch coincided with the National Employment, Education and Training Committee meeting hosted by Business SA. Guests included representatives of employer organisations from throughout the country. The initiative is a call to employers to expand workforce participation by employing ‘Outside the Box’ when they next recruit. The “Business Case for Recruitment and Retention of Mature Aged Workers” is the first of an accompanying series of employer guides. Ms Ellis said that in a time when some sectors are crying out for workers, it makes great sense for employers to look again at what older Australians can offer their business. “I congratulate the Australian Chamber of Commerce and Industry and Business SA on driving the cultural change we have to see in our work places over the coming years, and I urge every employer in South Australia to join them,” Ms Ellis said. "As a visible signal of this common cause, we are distributing widely within the private sector an "Employ Outside the Box" box. On desks, shelves, workstations and water-coolers it can prompt discussion and be filled with ideas, business cards and feedback. At the start of this parliamentary year, I am delivering this box to all federal members and senators. There will, and should be, plenty of debate in this election year about workplace matters. As we discuss the means to this end, we should not lose sight of the end. 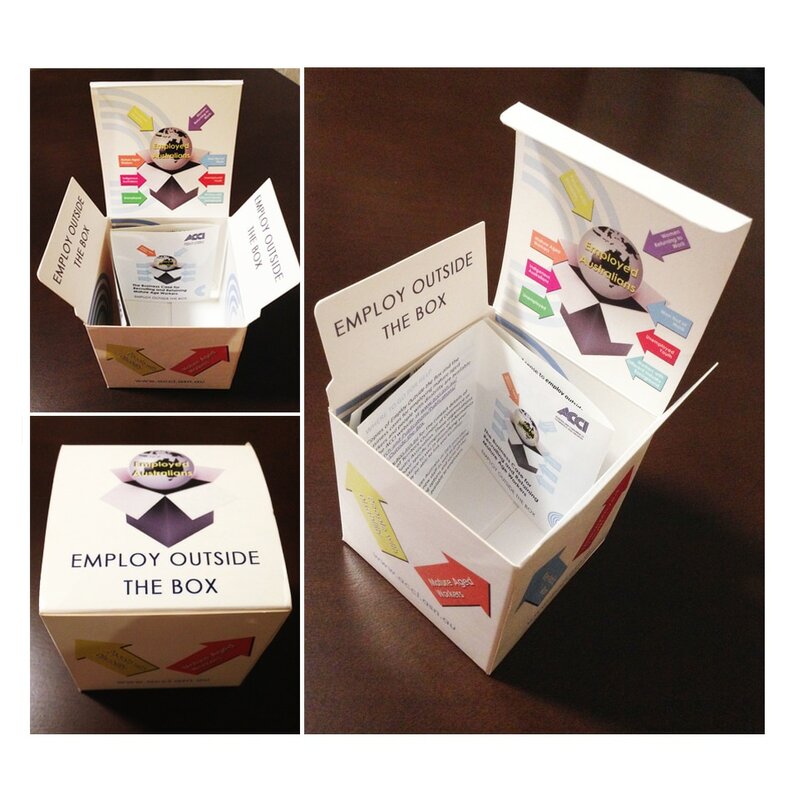 The cubed "Employ Outside the Box‟ can be a tangible reminder of common labour market goals on which we all stand." "As a visible signal of this common cause, we are distributing widely within the private sector an "Employ Outside the Box" box. On desks, shelves, workstations and water-coolers it can prompt discussion and be filled with ideas, business cards and feedback." 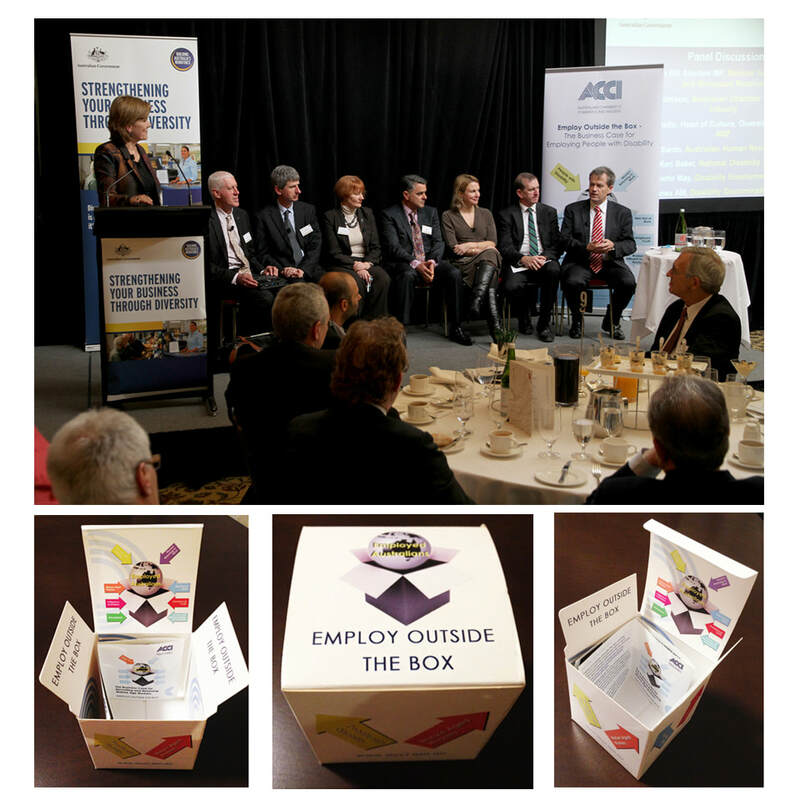 Employ Outside the Box 3D Object was distributed to all Parliamentary Staff and MP's in Parliament House, Canberra and ACCI Members in 2013. Designed and Produced by Monica Mosmondor, Designer MDIA. 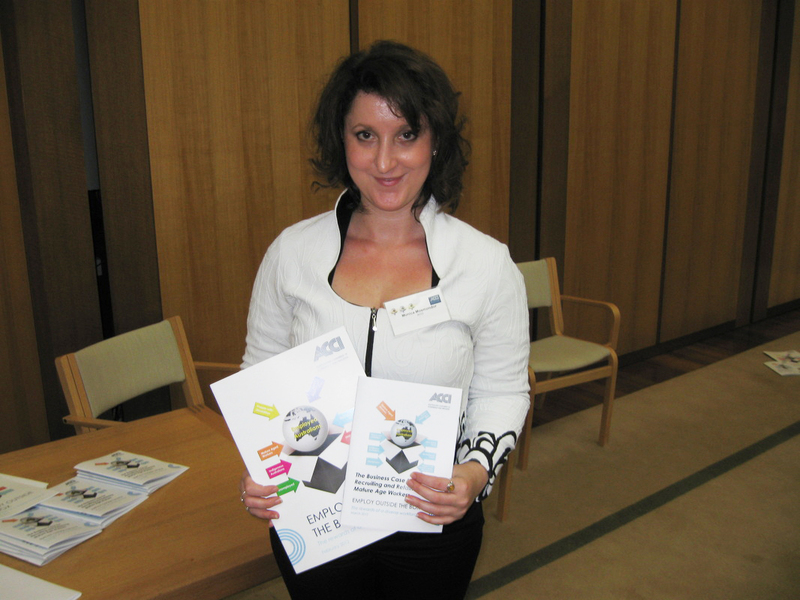 Monica Mosmondor - Designer MDIA holding her First Edition publication of 'Employ Outside the Box' at the launch in Parliament House, Canberra. 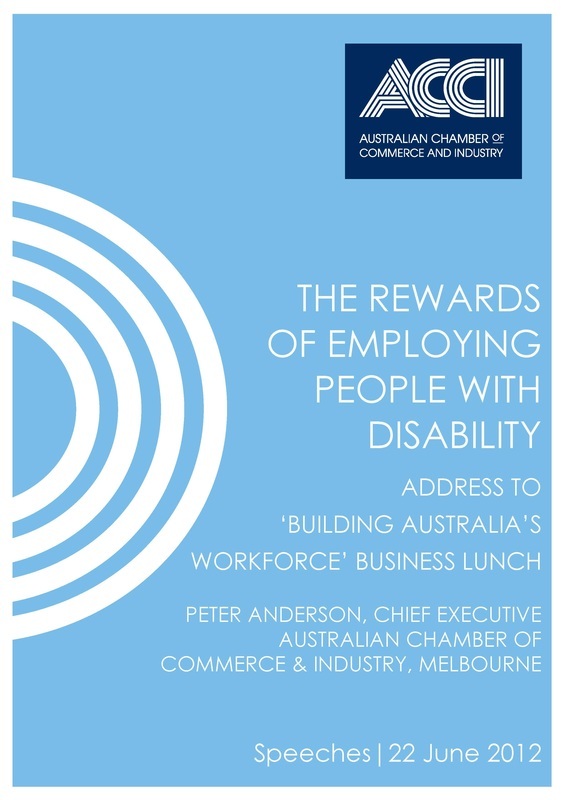 The Australian Chamber of Commerce and Industry (ACCI), Australia's largest and most representative business organisation, today issued a 'call to arms' for Australian employers to expand workforce participation by reframing attitudes to employing people with disabilities. 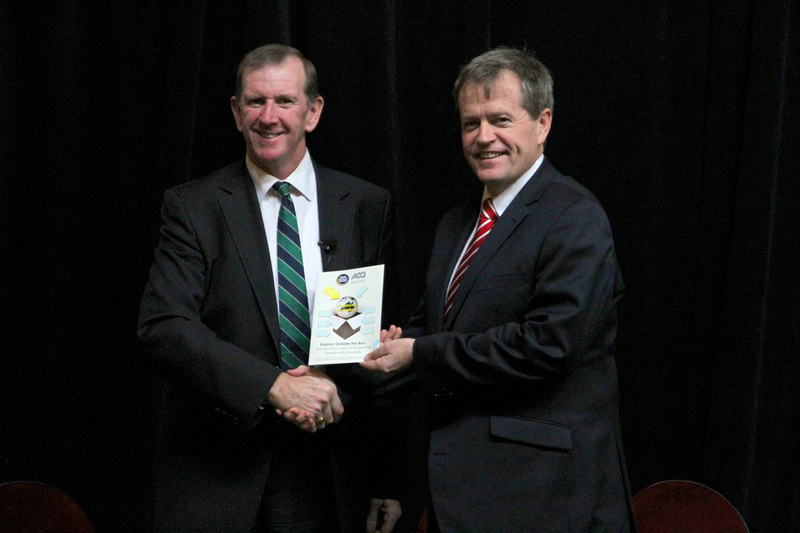 At the Melbourne Town Hall, Minister for Employment and Workplace Relations Bill Shorten and ACCI Chief Executive Peter Anderson launched Employ Outside the Box: The Business Case for Employing People with Disability, an employer guide developed by ACCI promoting workforce diversification. ACCI, our member organisations and National Disability Services are highlighting the benefits that people with disability can bring to individual businesses, and in the process, dispelling myths using business case-studies. "With ageing demographics, sluggish productivity and forecast skill shortages, industry must think laterally and long term when it comes to recruitment. Lifting labour force capacity has economic and social spinoffs. For the business community, this is not about charity, it is business common sense," Peter Anderson said. "Employees with disability are loyal and committed people, especially if the focus is on ability rather than disability. There is also government support for workplace modifications, free and confidential advice on hiring practices, financial incentives, and training to help raise skill levels." 'With many industries and regions experiencing significant skill and labour shortages, especially in regional areas, business must fully utilise available labour supply to meet our economic needs," Mr Anderson said. The Employ Outside the Box project encourages employers to develop innovative strategies to attract and retain valued employees to bolster Australia's participation rate. ACCI publications are available to employers across the nation through ACCI's network of Chambers of Commerce and National Industry Associations. ACCI and our members are also rolling out this initiative in regions and industry sectors. Mr Anderson’s speech is available at www.acci.asn.au. 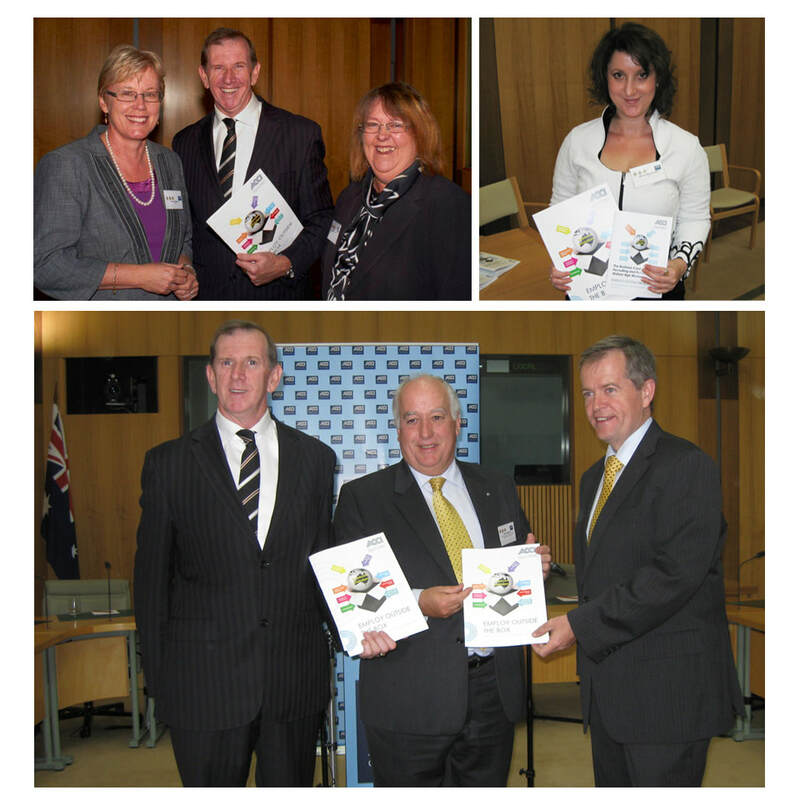 First Edition: Employ Outside the Box – The Business Case for Employing People with Disability, ACCI – June 2012. 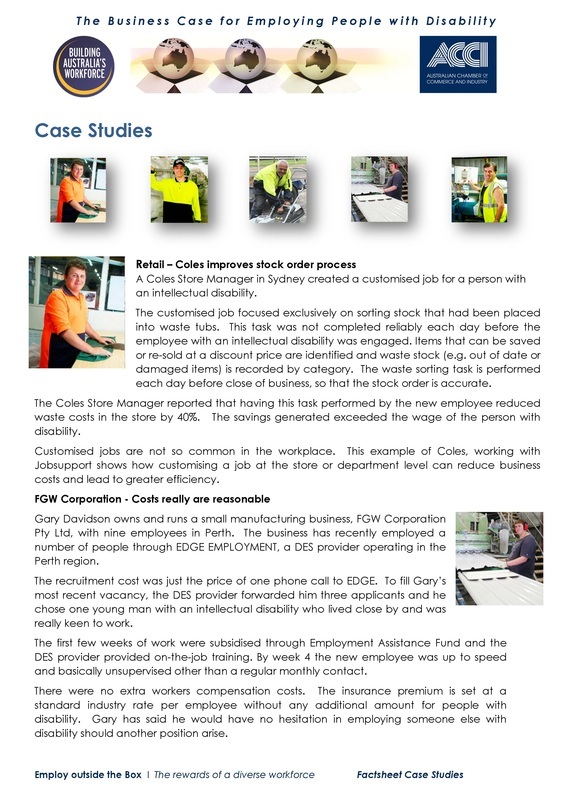 Click here to view the Case Study Fact Sheets - The Business case for Employing People with Disability - Design and Production by Monica Mosmondor, Designer MDIA. Click here to view Peter Anderson, Chief Executive ACCI Speech: The Rewards of Employing People with Disability, 22 June 2012 - Design and Production by Monica Mosmondor, Designer MDIA. 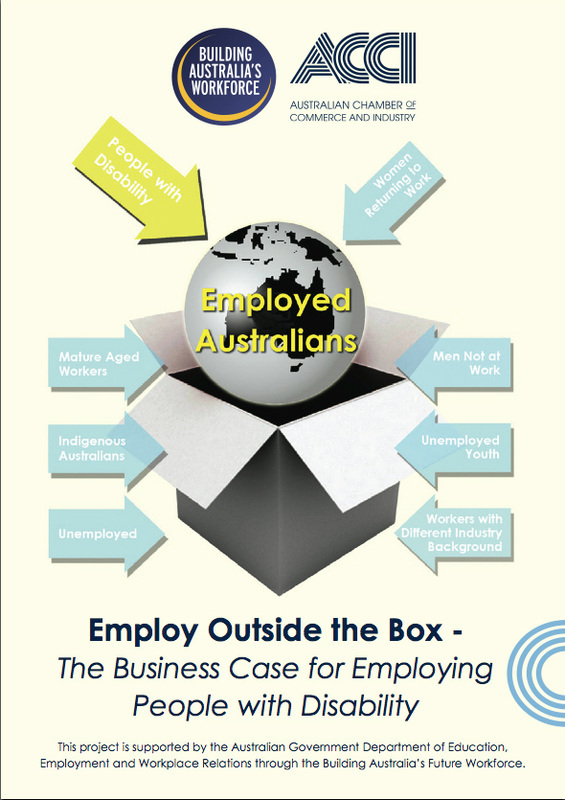 First Edition: Employ Outside the Box – The Business Case for Employing People with Disability, ACCI – June 2012. Design & Publication by Monica Shanahan (Mosmondor). On Friday 22nd June 2012, at the Melbourne Town Hall, the Minister for Employment and Workplace Relations, Hon. 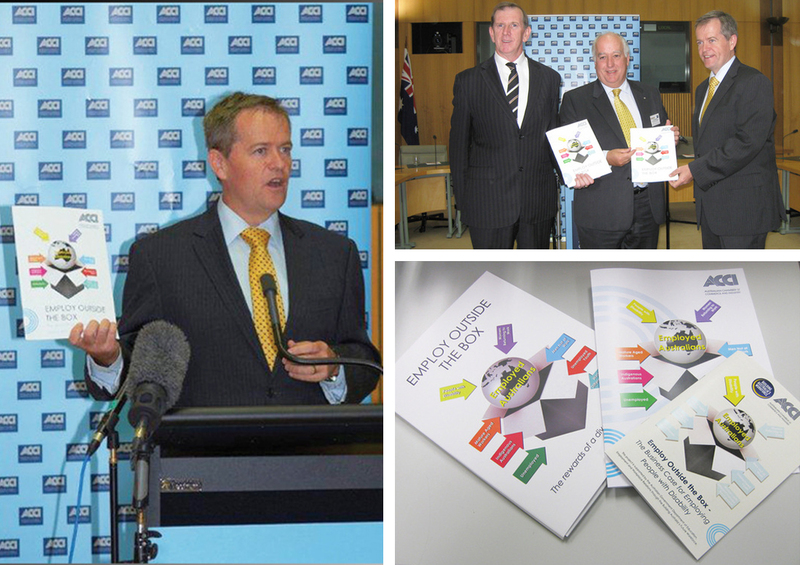 Bill Shorten MP and ACCI Chief Executive, Mr Peter Anderson, launched Employ Outside the Box: The Business Case for Employing People with Disability, the second publication in a series of employer guides developed by ACCI promoting workforce diversification. 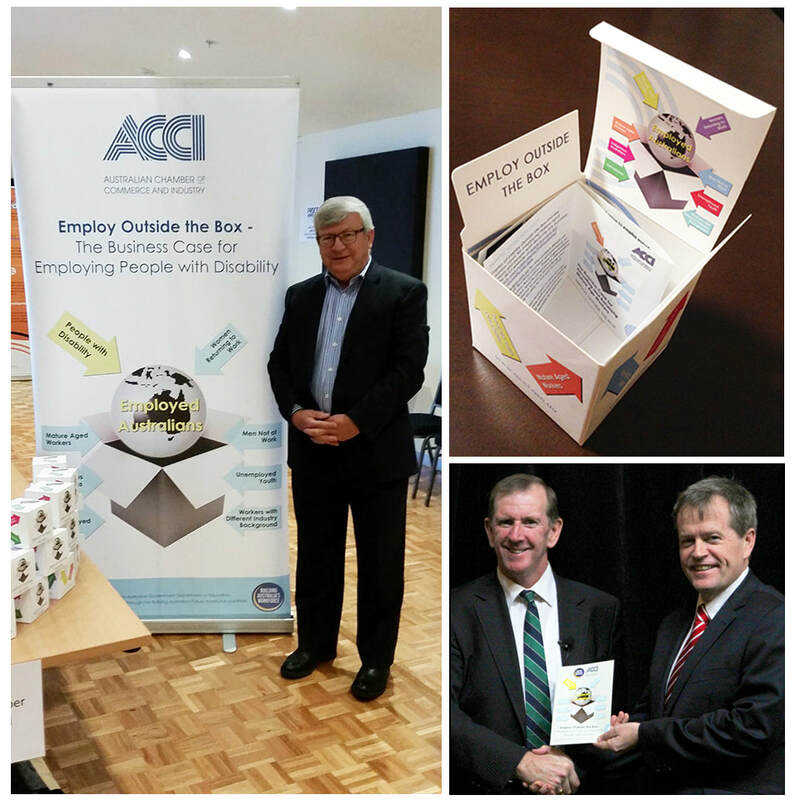 In addition to Employ Outside the Box, ACCI have developed a concise, business friendly handbooks, outlining the strong business case for recruiting mature aged workers, people with disability and Indigenous Australians. Monica Shanahan is a designer/ communications professional based in Canberra.